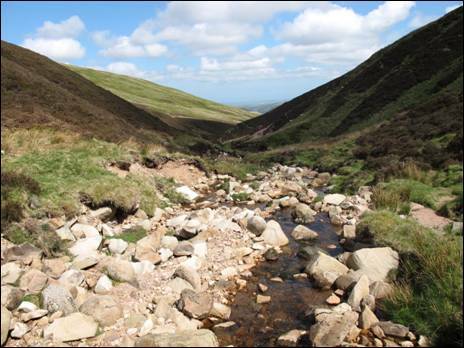 here are many special places in the Cheviot Hills where the pulse quickens and the heart races. Places which continually remind me why I am drawn to these wonderful hills which stretch out along the northern edge of England before slipping effortlessly into Scotland. Places that I return to time and time again. You will undoubtedly have your own favourite spot, somewhere you consider unique. It might be a waterfall, secreted in some half-hidden corner, like Linhope Spout or the rather more retiring Harthope Linn. It might be a rocky cleugh tucked out of sight or an ice-sculpted gorge such as the magnificent Hen Hole or the equally alluring Bizzle. ou might prefer sitting on a windswept hill top where a widescreen panorama anchors you to the spot and tempts you to `tarry awhile` longer than you intended. You might choose the Bronze Age burial cairn-topped Windy Gyle or the strategically placed Shillhope Law and an eye-watering view of Upper Coquetdale. You might be tempted by the small but perfectly formed double-domed Castles, overlooking the thread-thin Usway Burn and the remote farmstead of Batailshiel Haugh. There are endless possibilities. 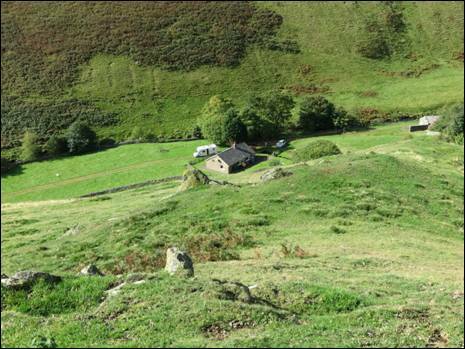 It is very much a personal choice, but whether it is somewhere close to a twinkling burn only a stone`s throw from the nearest valley road or some place more remote, rarely visited by walkers, it is, just for that short moment in time, your very own special place. I have my own places, acquired over many years of wandering these hills which, when re-visited, conjure up a plethora of happy memories. Places where I can sit with sandwiches in hand, and enjoy the moment looking back in time. Places where I can gaze out across the great expanse of hills and look forward to discovering a few more special places in the future. t was one of those days. The sun was in full flight, the sky was a perfect blue and I was ready, at what seemed like the crack of dawn, to make my first ever visit to the Hanging Stone, high on the southern slopes of Cairn Hill. But first I had to climb The Cheviot, something of a bruiser of a hill and, at 815 metres above sea level, the highest in Northumberland. There are many ways to reach the top of this often-maligned hill but I opted, on this particular occasion, for the most popular route from the Harthope Valley, some six miles from Wooler. I parked near to the Hawsen Burn, a particular favourite, and after following the road for a further 200 metres I joined the well-trodden path to begin my journey upwards. With the conical Hedgehope Hill to my left and the Harthope Valley receding over my shoulder I climbed steadily towards the flat top of Scald Hill. The flowering cloudberry, star-like in appearance, peppered the hillside as skylarks rose out of the grass, seemingly happy for my company. 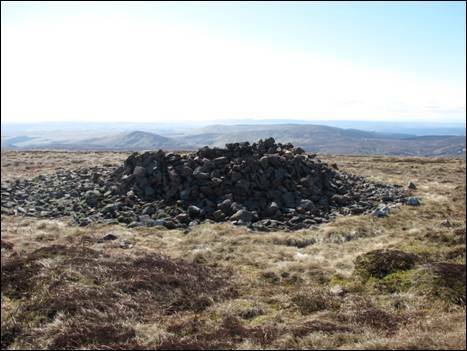 A short dip after Scald Hill gave me time to catch my breath and then the unrelenting slog to the cairn at the eastern end of the summit plateau. At the ladder stile, just beyond the cairn, I took time to admire the far-reaching views and then continued easily across a stone pathway to the sky-high triangulation pillar marking the top of this, the most iconic hill in Northumberland. 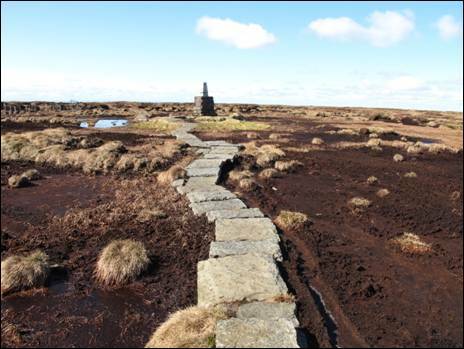 escribed by others as, “an uninviting morass of peat and bog” and “a desolate looking tract of treacherous moss-hags and oozy peat-flats”, the vast summit plateau can undoubtedly be a wild and lonely place. But on days such as this, when the air is clear and the wind is still tucked up in bed, The Cheviot is like a benign giant. As I stood there on the roof of Northumberland, a hare suddenly appeared in front of me, pricked up its ears and then exploded into the distance. You are never truly alone. I continued across the plateau towards Cairn Hill aided by an almost unbroken thread of flagstones and then I pressed onto the border fence. 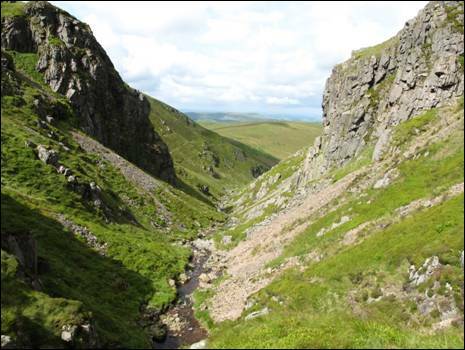 A short way to my right, I could see the stone men of Auchope Cairn peering into the rocky cleft of the Hen Hole and beyond to the head of the College Valley. My route now turned left following a section of duckboards, constructed in July and August 1989 to control footpath erosion, for a distance of some 500 metres. Along the way I passed a small plaque affixed to a rock which read, “In memory of Stan Hudson died 12th July 1981” and I wondered how many walkers had paused for a moment at this tiny memorial on their toe-tingling journey along this remote stretch of the Pennine Way. It was now time to leave the `security` of the well-worn path and to head east across 200 metres of deep and trackless heather to my intended destination, the Hanging Stone. I stepped out cautiously, eager to avoid the half-hidden rocks and the boot-sucking peat holes which lay mischievously in wait. he Hanging Stone is not, as the name might suggest, a single isolated stone. It is a rocky outcrop consisting of a series of large boulders cascading in a broken line down the slopes of Cairn Hill like a waterfall of grey stone. Lying nearly 700 metres above sea level it occupies an isolated location with unimpeded views to the south, east and west. The vast swathe of conifers which surrounds the upper reaches of the Usway Burn sweeps eastwards from the immediate tops of Score Head and King`s Seat whilst an ocean of hills rolls away on both side of the border. The tops of Windy Gyle, Mozie Law, Beefstand Hill, Yarnspath Law and Bloodybush Edge are especially prominent in the middle distance. The Hanging Stone positively oozes history. In 1249 the border country was divided into Marches, with their own laws meted out by appointed officials, and here, at one of the wildest spots on the border ridge, the Middle and East Marches met. Meetings, as often as not, ended in violent disagreement even death. The Hanging Stone is said to derive its name from the time when a packman was strangled when his pack slipped over the edge of one of the boulders, tightening the strap around his neck with dire consequences. Whether this is a fanciful story or cold, unadulterated fact, the Hanging Stone has atmosphere in abundance. It is a truly magical place. I could have stayed all day but as they say, time waits for no man, and with an interesting return route planned there was still much to savour. So, after a final glance to the south east and the long, green strand of the Upper Breamish Valley, I bid the Hanging Stone `au revoir` and started the ¾ mile back-track to the 777 metre high Cairn Hill. 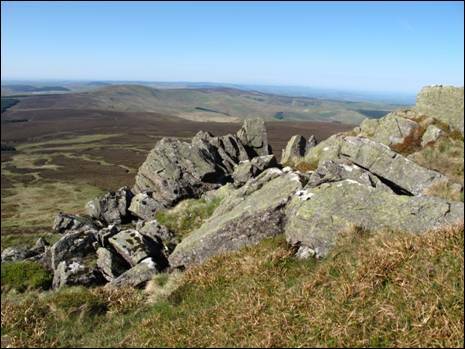 The flat, grass-carpeted top boasts a splendid stone shelter, marked on the Ordnance Survey map as Scotsman`s Cairn, and I once again enjoyed fine, faraway views. y route now tumbled downhill, following a clear, signposted path to the fledgling Harthope Burn. Close to the watershed, a small marker post indicated the start of the public footpath which, in a short while, turned north eastwards and headed down the valley. The faint path, caught between the steep-sided Cheviot and the peat hag-fringed Comb Fell, constantly crossed and re-crossed the thin burn as it began to gather momentum. On occasions the path disappeared altogether, washed away by the damaging floods of September 2008 and July 2009, but by always keeping in close contact with the burn I soon re-joined the path. fter 1½ miles following the burn I passed the delightful Harthope Linn and then, as the valley began to widen, the secluded cottage of Langleeford Hope. Picture postcard pretty and facing the shapely Hedgehope Hill, it would be difficult to find a more idyllic place than this to while away the time. As I wandered on past the white-walled farmstead of Langleeford, surrounded by trees on the opposite banks of the burn, I was nearing the end of my journey. With the memory of the Hanging Stone still fresh in my mind I was already beginning to make plans for my next visit to one of my very own special places. Now what about the Shivering Stone? This article was first published on the website www.thisisnorthumberland.com in 2012 utilising a different selection of photographs.